"Start this hearty stew in the morning. When you get home from work, simply cook up the noodles, add the veggies and thickener to the stew and by the time you set the table, dinner will be ready!" Place the beef, onion, mushrooms, garlic, thyme and rosemary in the crock of a 4 to 5 quart slow cooker. Stir in 2 cups (500 mL) broth and the tomatoes. Set the heat to Low and cook for 6 to 7 1/2 hours (or up to 10 hours). Turn the heat to High. Whisk the remaining broth with the cornstarch. Stir into the slow cooker until well combined; add the vegetables. Cover and cook for an additional 20 to 30 minutes or until heated through. Meanwhile, prepare the noodles according to package directions. Spoon the hot stew over the noodles to serve. 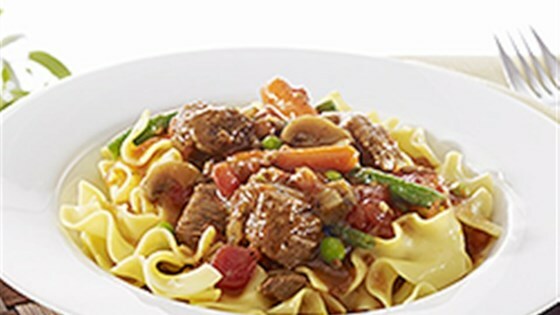 Replace the Dumpling Noodles with NO YOLKS® Extra Broad or Broad Noodles. To reduce the total cooking time, set the initial heat to High and cook for 3 1/2 to 4 hours before stirring in the cornstarch and vegetables. Quick-thaw the vegetables by placing in a colander and running under hot tap water; drain well.